Free downloads. Digital workbooks. PDFs. You're probably thinking the Bosscation strategy guides are just another 15-page document with a few pages of instructions, followed by giant blank boxes to fill out. Wrong! Fortunately, that couldn't be further from the truth! Here are five things that they are about! When building out anything in your business, from your social media platforms to your brand positioning to your products/services, you need to ensure you're aligned with your best strengths, passions and goals. It can be so easy to chase other people's dreams when you're not intentional with what yours are. Once you figure out your destination — where you want your life and business to head — you can then determine how to get there! Is it through 1:1 services, products, group programs? What are your best strengths and personality traits that can support your growth? Working out of your strengths and best traits will produce better work, which will drive more sales and referrals, which will motivate you to create even better work... it's a snowball effect towards success. This is why each of our strategy guides start with the "Nucleus Principle" — your non-negotiable core values and goals that ensure you're building the right thing for the right people (including yourself). I got this wrong with my brand design business and boy did I pay for it. I jumped into a "niche" that I had never worked with before, just because I thought I'd working with them. I saw that most wedding photographers appreciate good branding, and I had a background creating wedding invitations, so I thought it would be a great fit. I centered my whole business around targeting wedding photographers, only to discover that I was so much stronger with brand strategy for B2B companies like coaches, not B2C! If only I had realized my strengths and values before creating my entire business around a niche I wasn't cut out for! Forget the Venn diagrams and typical pros/cons lists... when you're making a decision, you need to dive a little deeper. Not all pros and cons are weighed equally. You need to measure things according to your "nucleus" to be sure your decisions are aligned with your personal and professional goals. Another key ingredient to making strategic decisions is in asking the right questions. But don't worry, I break those down for you. 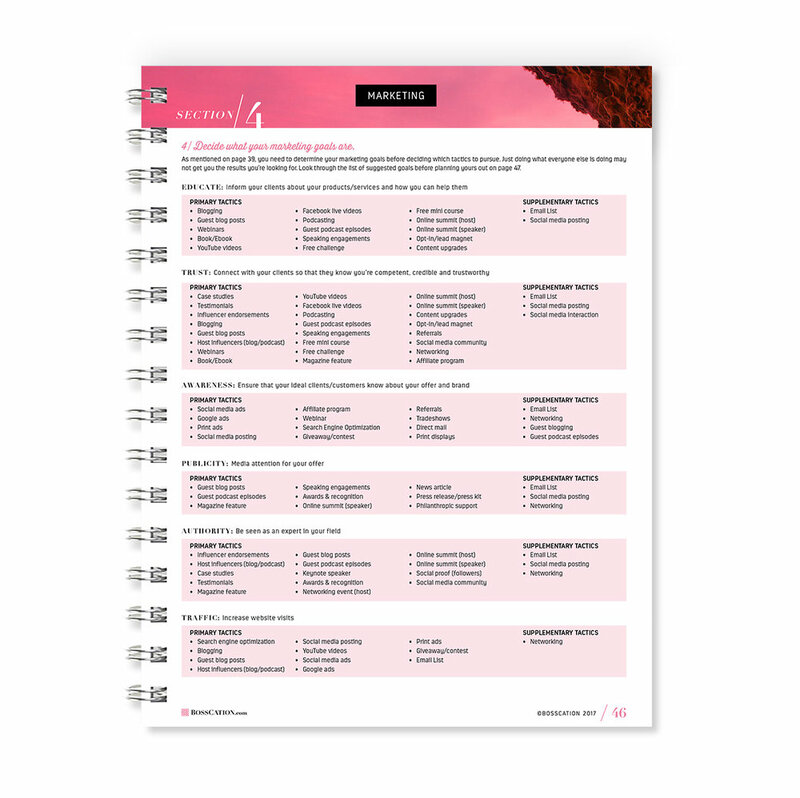 Our strategy guides provide thought-provoking charts for comparing elements that really matter in making your decisions. Never find yourself wondering, "what am I going to write about today," then whipping together something that may not flow with anything else you've posted recently. 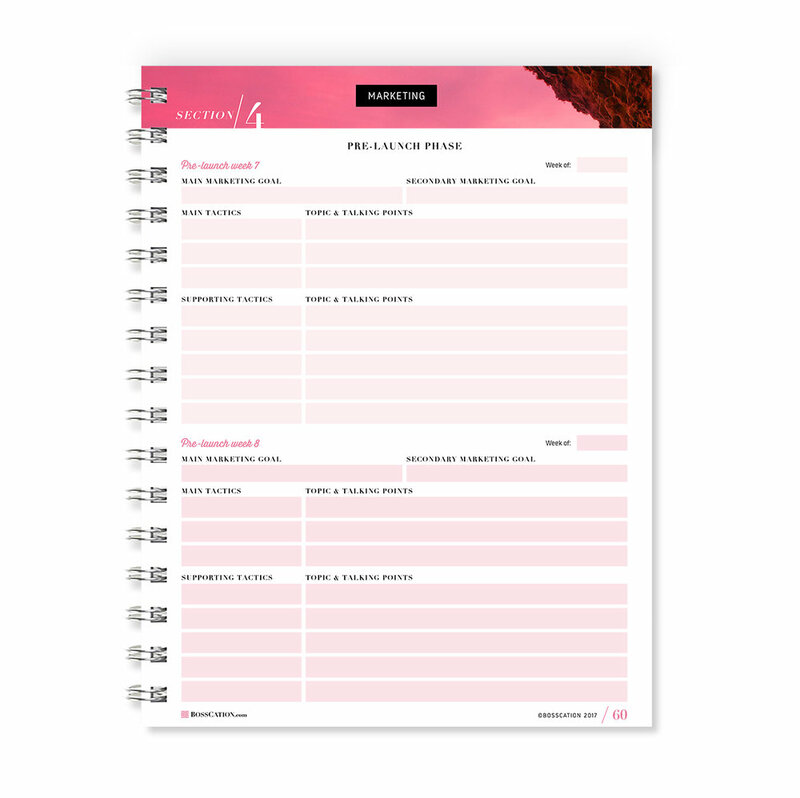 In our Ultimate Launch planner and the Content That Converts strategy guide, you'll first dig in to your marketing goals. You may think that posting to Instagram 3x a day will get you the visibility you need... but perhaps what your business really needs is to build some trust and authority. Maybe you should consider a webinar or being a guest expert on a podcast, instead! Determining your goals first will allow you to choose the best tactics and platforms to pursue. 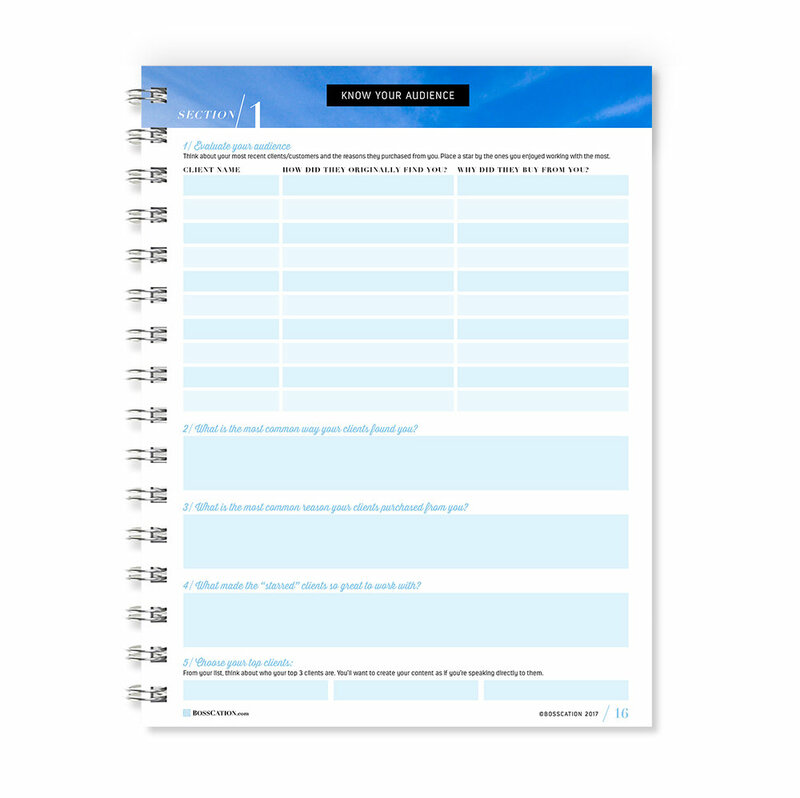 From there, you can create themes around the topics that will be best for your goals. Looking for awareness? Share some behind-the-scenes looks and posts about what your product/service can do for people. Need to build trust? Provide testimonials and case studies that prove you're legit. Trying to drive traffic? Perhaps you could host a giveaway or be featured on a popular blog or podcast! When building out a new business, service, product or offering, most people look at all of their costs, to make sure they have the budget for creating this new thing, but what's often neglected are the time commitments. If you calculate you need eight months to create your new course, and it's supposed to be a 1-time offer valued at $1500, how many do you need to sell to make it worth your time? Is that realistic? Once again, we come back to the nucleus principle here... what are the non-negotiables for this offer? If you realize you're going to make $5/hour after all of your time and expenses, something has got to change! 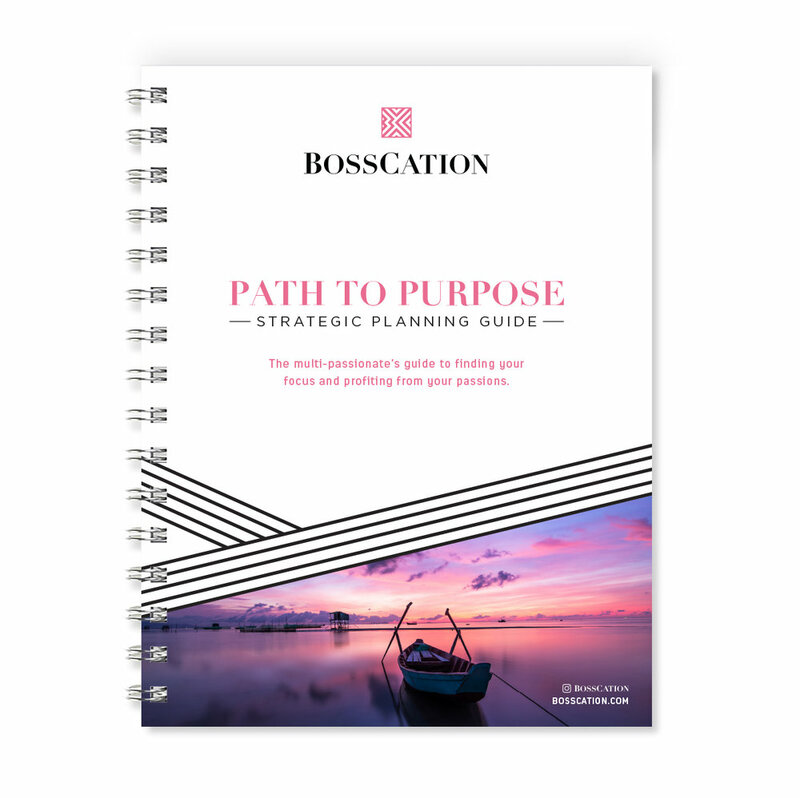 While it's not the most "fun" section of our Ultimate Launch planner and Path to Purpose strategic planning guide, it's definitely an important section to make sure your idea is feasible, and to have a realistic expectation heading into the project. If you've ever watched HGTV for more than 5 minutes, you'll probably notice how every project has an unexpected turn of events that costs them time, money or both. It's important to think through everything before getting started, and to build in a little wiggle room for the unexpected! If there are certain tasks that you dread or aren't as strong at, they'll end up being a bottleneck that can really hold you back! Take, for instance, writing blog posts. Let's say you want to create your social media posts and newsletter around your weekly blog, but you absolutely hate blogging. This causes you to procrastinate and/or spend hours on every post. By the time you've finally written, edited and posted your blog, you have no time or energy left to create cohesive content for other platforms. This will leave you with a few issues, either your content won't be cohesive and strategic, or it won't be created at all! If you have a team, your bottlenecks could keep them from doing their job, or doing it efficiently. If you send your blog post to your social media manager the day before she's supposed to schedule posts around it, she won't have time to create the best captions. Our Path to Purpose and Content That Converts strategy guides take a deep look into the things that hold you back, so you can know what to hire out or work on improving, to keep you pressing forward. Perhaps your aversion to blogging is actually from not knowing what to even write... or maybe you struggle with determining your brand voice, so you re-write every sentence. Figuring out what holds you back is the first step towards breaking through! Each strategy guide was created for a different purpose, so I'd love to share a little about who each one is for. I'm all about being strategic with your time, so I don't want you purchasing something that isn't a good fit. It's time to plan out and launch that big idea you've been keeping in your pocket. No more excuses, let's hash out your exact target market, packaging & pricing, team & tech, timeline and content. Come home with an action plan and timeline that's ready to implement one step at a time, so you'll be ready to launch in a matter of weeks. Are you a multi-passionate entrepreneur who struggles to decide between ideas and aren't sure what path to take? You've tried juggling multiple businesses, but that just waters down your messaging and keeps you from focusing on ONE! It's time to find YOUR unique path to profit so you can turn your passion into profits. You've got some ideas for blog posts and social media content, but you feel there's never enough time to plan ahead. Every week you open up your computer, stare at the screen and wonder, "what am I going to write today?" If that sounds like you, then you need the Content That Converts strategy guide to help you outline and prepare a cohesive, structured content plan for the entire quarter.